New England winters are usually filled with frigid weather, snow storms and icy roads. 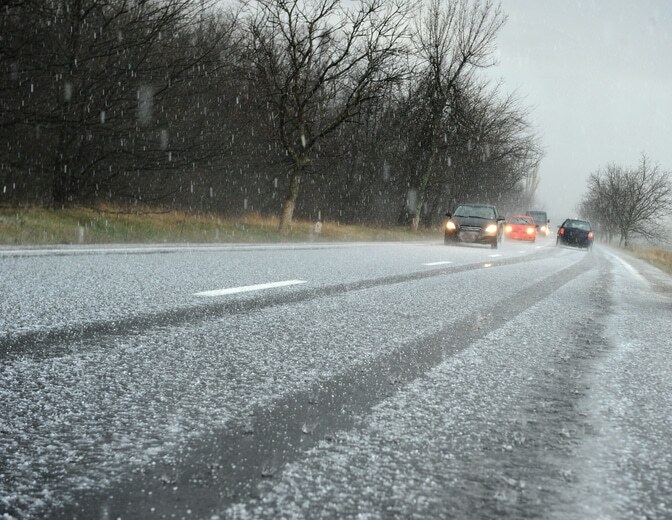 These weather conditions lead to an increase in accidents and injury on the road. To keep you safe this winter Rob Levine and Associates assembled some tips for driving on snowy and icy roads. Do not use Cruise Control on Slippery or Icy Roads. It is integral you control your speed when driving on snow or ice. Cruise control sets your speed at a constant, but in weather like this the speed of your vehicle should vary based on the terrain you are on. During storms, go easy on your breaks and most importantly go slow. Slipping is usually an indication you are going too fast, and slamming on the breaks can worsen the slide and cause your vehicle to spin out of control. It doesn’t take much snow to make roads slippery. Most fatal accidents happen during light snow or ice conditions because drivers don’t use caution while on the road. When it begins to snow, slow your speed. In any below freezing weather, make sure you have your eye out for black ice. Avoid creating snow piles by sidewalks or driveways; this can interrupt your vision when backing out of the driveway, which would increase the risk of an accident. Most of the time you begin to slide because you are going to fast or you pressed on the breaks. If you start sliding and losing control of your vehicle, steer in the direction the back of your car is turning. You must also be cautious not to over steer, because this may make your car spin the other way and lose more control. In this situation it is always important to stay calm during this situation and refrain from slamming on the breaks.